Try to figure out what they're saying. Preferably without being caught. Better idea! She's pretty sure that the consequences of being seen in here, potentially days before all of this actually started, would be bad. >Bina, I have a bad feeling you're going to find out exactly what… happened here. Bina's not sure about that, none of the voices outside sound like Gregor and there are at least three people talking. Maybe more. >Is one of them a woman's voice? Perhaps a woman of viridescent hue? Bina's not sure if any of them are Gregor's 'Green Lady', but at least two of the people outside are women. 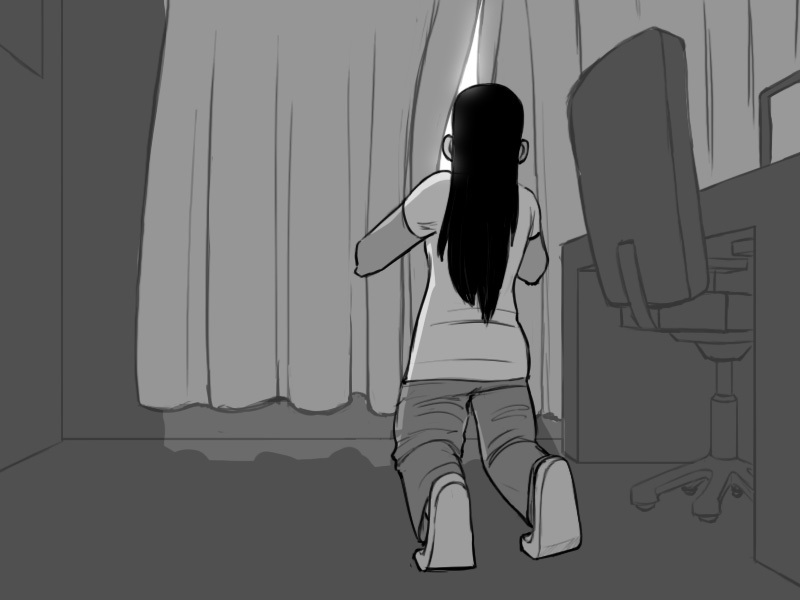 Bina creeps around the desk and carefully peeks out the side of the curtain. Tease update! Sorry! I had a lot of design work today and I couldn't get the second panel done.